A record 34 projects have been recognised by the Building and Construction Authority (BCA) for overcoming challenging site conditions or delivering stellar workmanship. They received 16 awards and 18 certificates of merit under the annual Construction Excellence Award, which is now in its 30th year. "The record number is a testament to the progressive improvements made by builders," said Construction Excellence Award assessment committee chairman Lai Huen Poh, who is also the managing director of RSP Architects Engineers and Planners. Among this year's winners is 368 Thomson, the first private residential project to achieve the highest Star rating under the national Construction Quality Assessment System (Conquas) framework, administered by the BCA. Other winners include Samsung C&T Corporation and Ssangyong Engineering and Construction, which were both working on contracts for the Marina Coastal Expressway. The two firms overcame challenging conditions to build the road tunnels: deep layers of soft marine clay, and an existing seawall left from previous reclamation work, respectively. 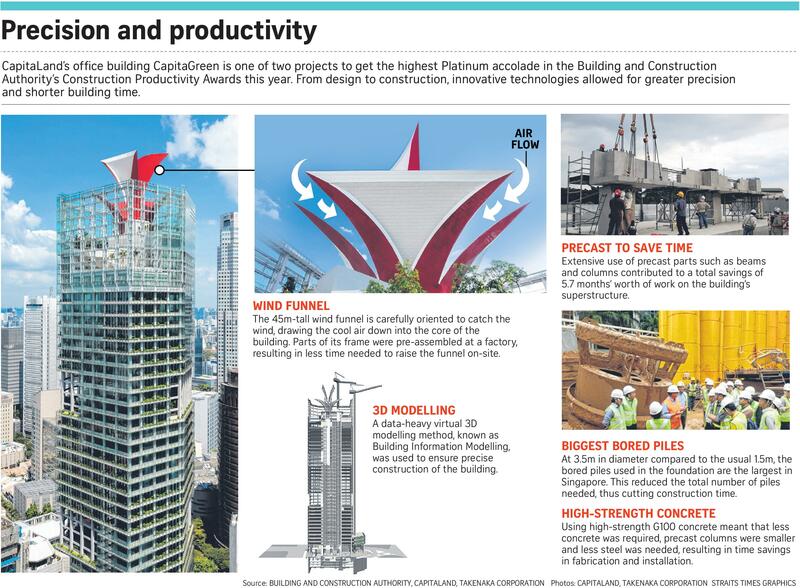 Separately, efficiency-boosting methods such as precise 3D modelling and the extensive use of precast parts helped nine projects to bag the BCA Construction Productivity Awards. Receiving the highest Platinum accolade were condominium 76 Shenton and office building CapitaGreen. The condo 76 Shenton was designed such that components of the building could be mass- produced for economies of scale. To achieve truly game-changing productivity improvements, we have to push for an even higher level of prefabrication in our projects through the Design for Manufacturing and Assembly approach. MR JOHN KEUNG, BCA's chief executive officer. The seven Gold award winners were commercial building Galaxis, retail and industrial building Aperia, JTC's industrial building at 73 Ayer Rajah Crescent, Nanyang Primary School, and three Housing Board projects. One productive method adopted by most winners was Building Information Modelling, which involves building data-rich 3D models. This allows problems to be spotted before construction begins, thus avoiding the need for rectification works. BCA chief executive officer John Keung praised the industry's progress in adopting prefabrication, but called for it to go further. "To achieve truly game-changing productivity improvements, we have to push for an even higher level of prefabrication in our projects through the Design for Manufacturing and Assembly approach," he said. Entire parts such as bathrooms or rooms can be made off-site and assembled on-site, he added. All winners will receive their awards tonight during the BCA Awards ceremony at Resorts World Sentosa.